134. James Augustus6 GIRAULT (Jean7) was born in Natchez District, Adams County, MS, August 6, 1793. He died March 24, 1851 in ?Jackson, Hinds County, MS, at 57 years of age. He married twice. 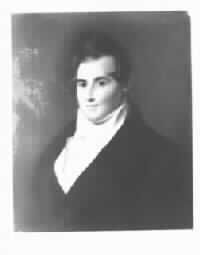 He married Mary J. CROZIER June 22, 1819. He married Susan DUNBAR November 30, 1825. She was born near Natchez, Adams County, MS February 18, 1810. She died August 30, 1889 at "Oak Mount", Limestone County, AL, at 79 years of age. Her body was interred in the Gamble Family Cemetery at "Oak Mount", Limestone County, AL. 135 i. Mary Elizabeth5 GIRAULT was born near Natchez, Adams County, MS, February 19, 1827. She died November 1885 in Mooresville, Limestone County, AL, at 58 years of age. Mary's occupation: Homemaker. 136 ii. Matilda Dunbar GIRAULT was born at 'Ben Lomond', Wilkinson County, MS, September 25, 1828. She died August 15, 1836 at 'Elliot', Tallahatchie County, MS, at 7 years of age. 137 iii. James Augustus GIRAULT Jr. was born at 'Ben Lomond', Wilkinson County, MS, August 4, 1830. He died August 1, 1837 at 'Elliot', Tallahatchie County, MS, at 6 years of age. 138 iv. Susan Augusta GIRAULT was born near Natchez, Adams County, MS, October 19, 1832. She died December 2, 1898 at 'Wildwood', Grenada County, MS, at 66 years of age. She married James Madison DUNKIN|DUNCAN July 26, 1849. He was born 1849. He died 1871 at 22 years of age. + 73 v. Helen Perina GIRAULT was born March 20, 1835. 139 vi. Thomas Hinds GIRAULT was born at 'Elliot', Tallahatchie County, MS, January 1, 1837. He died September 20, 1837 at 'Elliot', Tallahatchie County, MS, at less than one year of age. 140 vii. Robert Dunbar GIRAULT was born at 'Bellevue', Tallahatchie County, MS, February 20, 1839. He died July 22, 1862 at 'Bellevue', Tallahatchie County, MS, at 23 years of age. 141 viii. Martha Wade GIRAULT was born at 'Bellevue', Tallahatchie County, MS, October 6, 1842. She died February 6, 1864 at 21 years of age. Martha's occupation: Unmarried.